A ll of us are familiar with the Law of Gravity and many understand the Law of Attraction—and that is the Law of Resistance. Simply put it says, “if you exert a pressure against something there will be a resisting force pushing back. If you pull on something there will be a similar force pulling in the opposite direction.” We can experience resistance mentally as well as physically. So what does this have to do with your dog? A lot more than you might think. Firstly, if you pull on the leash, the dog pulls back. If you push on the dog’s back to force him down, he resists with stiff legs and pushes back. If you get loud and aggressive with your dog you can be assured he will resist and counter your moves with flight and sometimes aggressive moves such as barking and growling and this could even escalate to biting. Keeping this in mind, use this to your advantage and go about training your dog. The most common situation is the dog that pulls on the leash. Firstly let’s clarify a few things. Training your dog to walk on a loose leash is different from taking the dog for a walk. Taking the dog for a walk is what you do after he learns to walk on a loose leash. We don’t use choke collars, pinch or prong collars, and you never use a harness. Harness’ are for sled dogs and oxen. If you fasten your leash to the center of the dog’s back you empower him and in fact make him stronger so he can pull even more. The easiest solution is when the dog pulls you don’t pull. Walk your dog on a LOOSE LEASH. When you start this new process you put the dog on your left side in a sit. (You have taught him to sit on command, haven’t you?) With a loop of a few inches in the leash you say, “let’s go” and step off. If he goes to the end of the leash, you stop. Patiently wait for him to look your way and take a step back and put him back beside you where you reward him for coming back to your side. 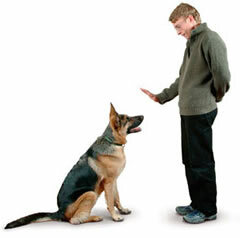 From now on you are teaching the dog that his place is at your side both when you are walking and when you have stopped. Every time he assumes that position he is rewarded. When he gets out of position you stop and put him back where he belongs and reward him when he is in the right place. This requires discipline and correction followed by rewards for correct actions. Initially this may take many starts and stops but eventually the light will go on and he’ll realize you want him to be beside him. Soon he will be walking short distances before he gets out of position and by now you can help him to stay in position by changing speeds and changing directions accompanied by stops and starts. So let’s review. Train with a flat collar and a LOOSE LEASH and a pocket full of rewards. Be persistent and teach small bites with successful positive results. Practice at least 3 or 4 times a day. Teach first and then go for the long walk. From now on he is never allowed to pull and walk at the end of the leash. If you compromise you’re simply telling the dog that he is doing it the right way and it’s okay to charge to the front and pull.